A number of landlords and estate agents have always wondered how to best rid themselves of very stubborn tenants without erring in law, apparently some of these tenants unscrupulously seek to exploit the lacuna in the law just so they can live in a property for years without paying rent, I have heard of such tenants and the landlords are usually always bitter about such situations. 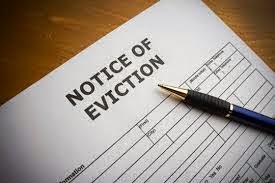 Some landlords have always resulted to self-help by forcefully evicting the said tenants but a recent decision of the court where such a landlord was directed to pay damages and compensation to the forcefully evicted tenant will seek to discourage many others. six (6) month’s notice for a yearly tenant. It’s important to note that when the tenancy is for a fixed period (e.g. one year) and such period has expired but the tenant refuses to give up possession, if the landlord intends to recover possession, he shall serve a seven (7) days written notice of his intention to apply to recover possession. Such notice will be classified as properly served when handed to the tenant in person; to an adult residing on the premises; by courier to the address or posting same on a prominent part of the premises. Upon expiration of the 7 day ultimatum, if the tenant still refuses to give up possession, the landlord may file a claim for recovery of possession against the tenant in the magistrate court or high court where the premises is located. A court can also order possession if the tenant is in arrears of rent; has breached any covenant in the agreement; where the premises is required for personal use by the landlord and where the premises requires substantial repair. A court shall also have power to make an order for possession upon proof of facts that; the premises is used for immoral or illegal purposes; has been abandoned; is unsafe and constitutes a danger to the public or the tenant simply constitutes a nuisance.